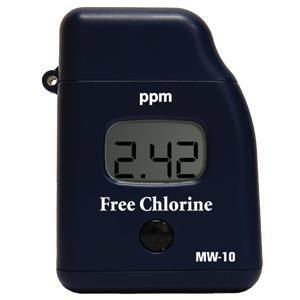 The MW10 Free Chlorine Colorimeter provides reliable measurements of Free Chlorine levels in your water. It has a large, easy-to-read LED screen. Ideal for ponds, pools, spas, and fish tanks. Adaptation of USEPA method 330.5. The reaction between Free Chlorine and the DPD reagent causes a pink tint in the sample.